Email marketing is not dead. In fact, it’s far from being outdated and transforms itself day by day. Long gone are the days when people sent the same email to all customers, no matter who they were, or what they liked. Updated from the latest big data and machine learning technology, MailBot analyzes the purchase behavior of your customers and makes smart, data-driven predictions about the items each individual customer like or will purchase in the future. 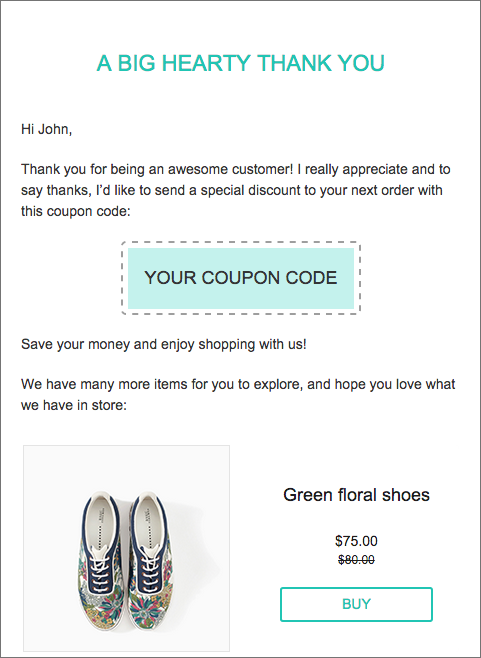 It’s a powerful personalization tool that will help you get the right products in front of the right customers and sell more stuff by following up with them in targeted emails. Is it powerful? Yes. Is it hard to use? No. Within 10-minute read, you’ll be given the guide to the most powerful email marketing tool that helps you reach, convert and engage every single visitor to your store. To give you more free time and less manual work of writing newsletters every week, we create Newsletter Bot as your assistant robot that automatically plan your weekly personalized emails to each customer. NOTE: Help Mailbot to recognize which products it should pick as New Arrivals to send in this campaign, by adding “new arrivals” tag into your chosen products in your shop admin, as our instruction here. Newsletter Bot will run everyday to analyse your customers’ behaviour, inventory, sales history of the store, so that it can pick right products to promote to right people. 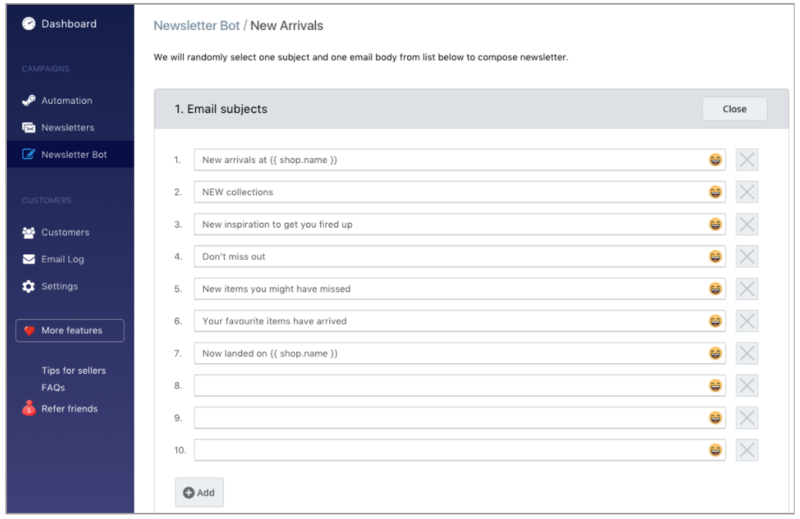 There is a library of subjects and email layouts for Newsletter Bot to choose from, so it will not send emails with same titles or templates in consecutive weeks. Without your approval, Newsletter Bot will only draft emails, and send you notifications 3 days in advance so you can review, edit, and approve to send its emails. 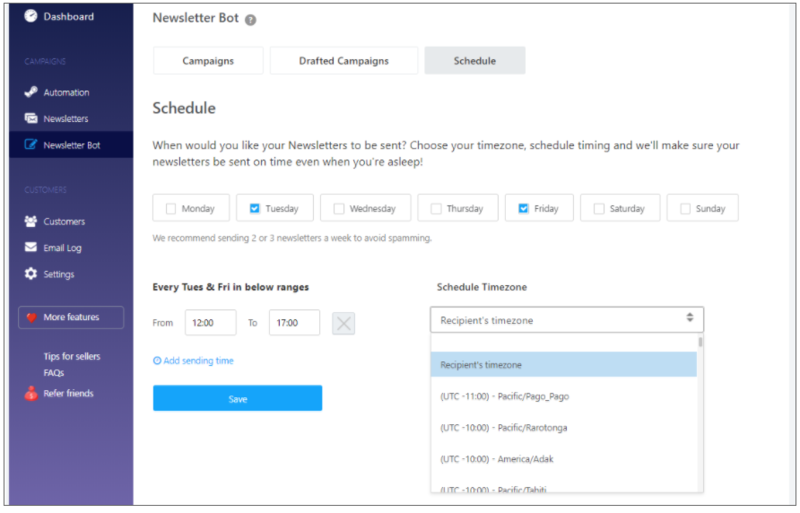 Newsletter Bot sends emails on date and time you schedule, doesn’t send more than 1 email to 1 customer in a day, and send at maximum 3 newsletters to a customer in a week. Based on each customer’s actions on your store, Mailbot will trigger the right email when customers enter a segment, with Rule-based Campaigns tool. When a visitor views some products but hasn’t added to cart yet, this campaign will send nurturing emails to remind them of those products. – When a visitors adds some products to cart but abandons, this campaign will send cart-recovery emails to motivate them check out. 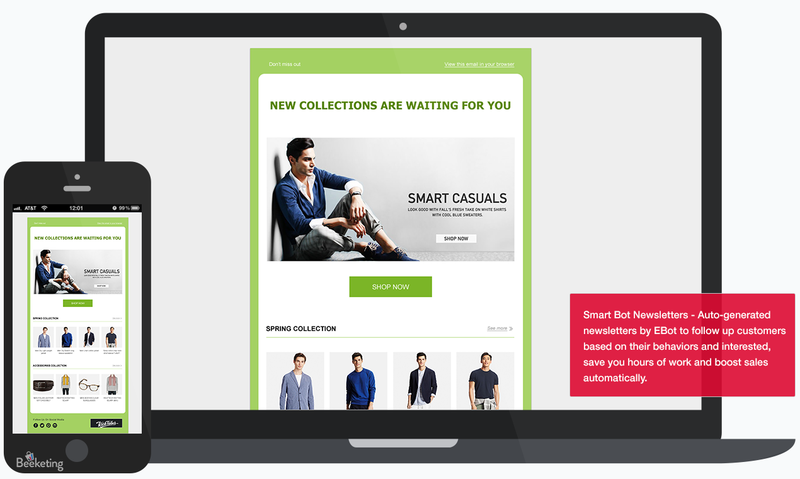 All emails will be sent based on customers’ behaviors. You can freely change the frequency of emails; or subject and content of each email if you like. We already have predefined most common e-commerce segments to help you target your customers, however, creating segments with MailBot is so powerful and so fun that if you master it, you can target almost every single visitor on your store. 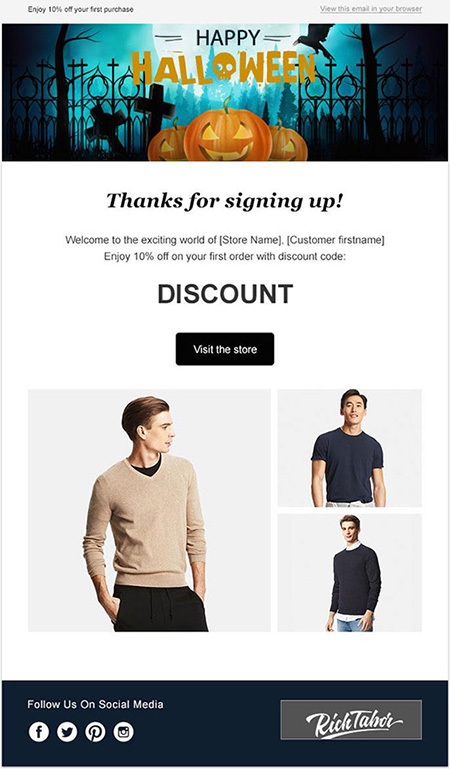 For example: by segmenting visitors who purchased a specific collection, you can send targeted emails to those customers promoting another matching collection. Would it be awesome to follow up customers who purchased camera to send them 5% discount on portable battery chargers or memory cards? By this way, you can easily increase your average order value from each customer and turn them into loyal ones. Segmentation is easy, at the same time, the hardest part already, so it’s 80% finished when you complete this step. 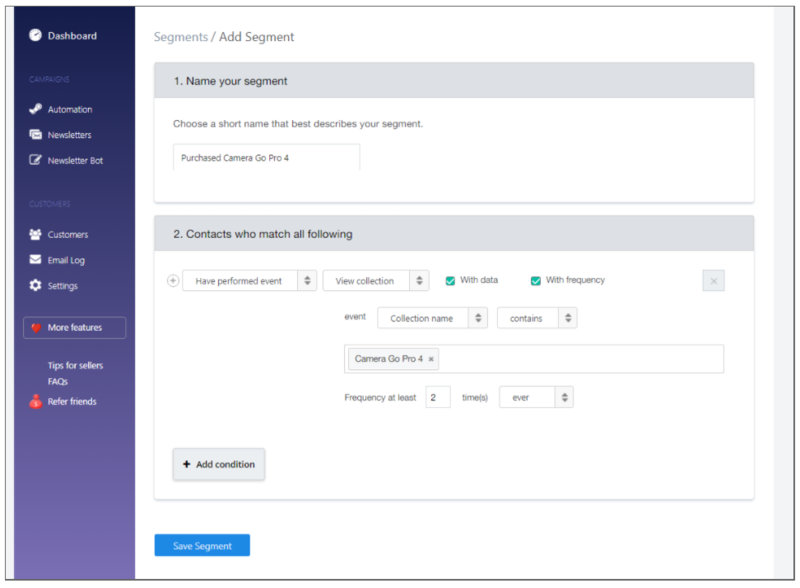 We’ve already made a step-by-step guide document and an A-to-Z instruction video to help you master customer segmentation with Mailbot. If you need any help in creating a segment you want, Contact Us to get support! According to a report from Entrepreneur, 121 is the number of emails an average person receives per day. Honestly, you open and read a lot of them every single day. With such a huge number, how to make your emails stand out, generate quality sales opportunities and leads for your online store? Let’s find out! It goes without saying that subject line of email plays a pivotal part when it comes to making that email get opened. In fact, 47% of email recipients decide whether or not to open an email based on subject line alone. For this reason, crafting subject lines that are compelling enough to get people to click through is absolutely a must. Make recipients curious at all times: If your subject line can arouse the recipient’s natural curiosity and interest, they’ll have to open the email to get more information. As a result, the open rate of your email gets a chance to be improved. Create urgency and scarcity: Creating urgency and scarcity in an email subject line is one of the never-get-old tactics which helps to enhance the open rate. It is recommended that you use words such as “ends tomorrow”, “offer expires Thursday”, “get it before it’s gone” or “only 5 spots left” to encourage your recipients to read the email as soonest as they can. Tips: Now not only can you easily edit your email preheader, but also can send randomly subject line of weekly newsletters emails by using Maibot, which makes people more likely open your emails. You will not want to see your emails being sent straight to the Promotions box even before people can take a look at them. One of the easiest way to keep them out of the Promotions is by cautiously choosing the words you use in email’s subject line. Make sure that it stays away from “Sales”, “Discount”, “Click”, “Offer”…they may be sending your email to the junk folder right off the bat. 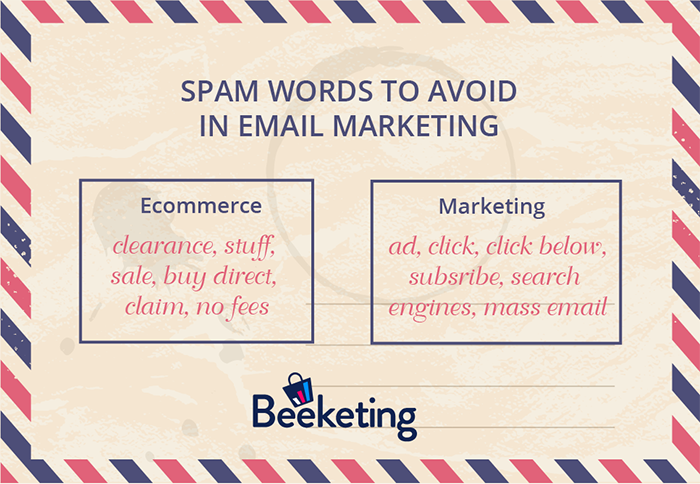 By avoiding these words in your email subject lines, you can dramatically increase your chances of getting rid of going to spam folder. Spam/ Promotion filter of email is now smarter than ever to reduce the number of emails people receive everyday, which will go through a long list of spammy words and characters to decide whether or not your emails are inbox-ready. Thus, the time and effort you put on content will go to waste if your email is flagged as spam or promotion. There is a list of trigger words that you should not put too much into your body text to make sure that your emails will not be prone to be promotional. It does not mean that you cannot use them, just be cautious of the frequency you put them into your email. After thousands of A/B tests and trials, we have wrapped up in this post 81 Words to Avoid In Email Marketing and other tips that ensure your emails to straight up into customers’ inboxes. Many people still strongly believe that using ALL CAPITAL LETTERS is a great way to get audiences’ attention. But it’s not. On the contrary, it would be the quickest way to trigger spam filters and make your email looks rude, untidy and unprofessional. Simply use capital letters for important words that you want to emphasize and do it on purpose. 3.5. What’s the best time to send Marketing emails? It’s not what you’re thinking of. Timing may not be everything you need to reach a high conversion rate but it certainly matters when it comes to making audiences decide to read it or not. The best time to send emails is when people are reviewing their inboxes. For maximum open and click rates, morning and early afternoon are highly recommended by email marketing experts. Furthermore, emails sent on mid-week days (from Tuesday to Thursday) result in best open rates. Why’s that? Weekends are for resting, and Mondays dedicated to very important work. They will not hesitate to pass by your emails on these days. Plus, if you are selling to international customers, make sure you communicate with them while they are awake. On special holidays, it is recommended to customize your email design that deliver the special feelings that bring customers right in the shopping mood. In Mailbot, we’ve pre-designed a Holiday Layouts Collection to help you send beautiful newsletters to customers on these days. Mailbot app is easy to start with, however, there are a lot of interesting tricks you might be surprised at. Let’s take a deeper look into what we can do with Mailbot and take the most advantage of it! New products and hottest items from your store will show up in preview mode of “New arrivals” and “Top picks of the week” campaigns accordingly. Therefore, you can double check to see if those campaigns have picked the products you like or not, every week. Preview mode of “New Arrivals” and “Top picks of the week” campaigns will show updated products each week. 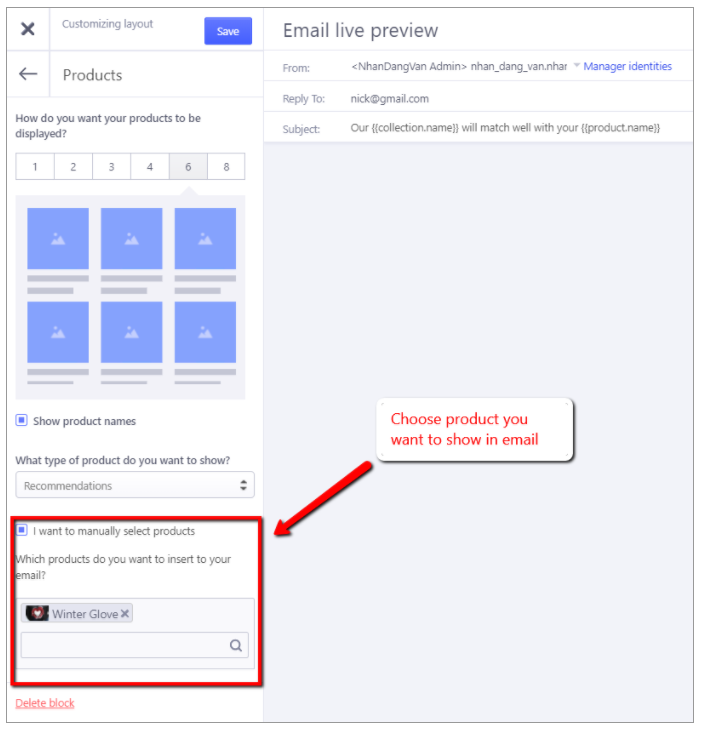 Test emails from other campaigns will take random products to display as they’re based on visitor behaviors, so each customer will receive different emails. 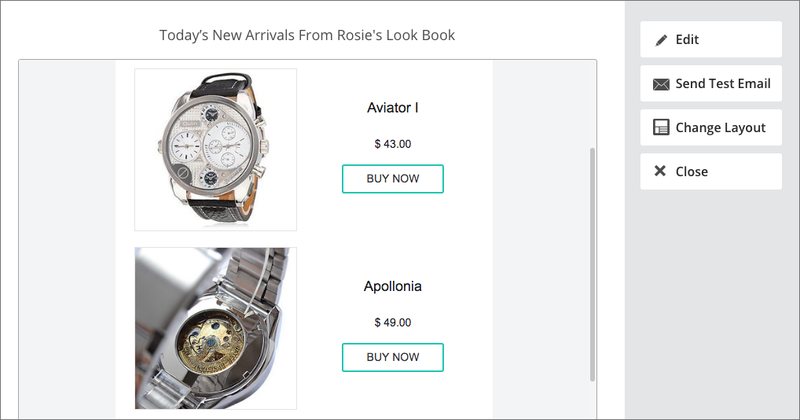 “New Arrivals” campaign will only send to customers only when you add “new- arrivals” tag to your items. (The tag can be changed up to you, new-arrivals is the default tag when you first install). Within 12 hours since the last products are tagged “new-arrivals”, Newsletter Bot will generate New Arrival campaign and schedule to send it on the nearest date to send weekly emails. 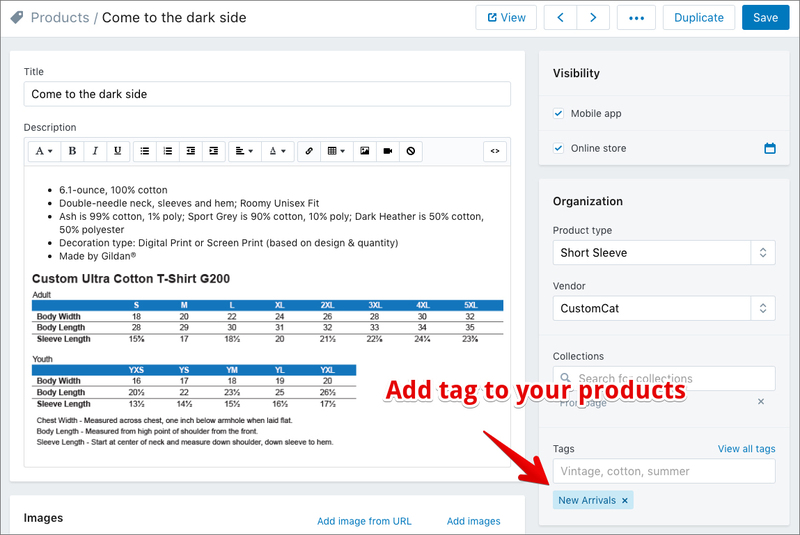 On the other hand, there might be some items you don’t want customers to see in emails at all, for example: a free-gift product, you can also add tag “Hidden” to those items and they will be hidden completely from your emails (please take note that it might take a few hours to update data from your tags). Do you know that though emails from our app are well-prepared and they can run automatically without you having to lift a finger, you can still choose products to show in each email if you want to customize? If not, it’s time for you to try it out! You can either choose product recommendation blocks (that will show relevant products based on customer behaviors) or a specific product you want. Easy, isn’t it? It is suggested that you verify your domain in order to increase email delivery rate. Don’t worry if you don’t have your own domain, you can still use the Sender email in this format firstname_shopname@beeketing.net as our instruction here. 4.6 Who won’t receive your emails? Weekly emails only send to customers who accept marketing, and won’t be sent to customers who are inactive for more than 4 months in order to maintain email delivery rate and reduce bounce. Unsubscribers in other email services you synced with Mailbot (eg: Mailchimp) will have the same status in our system and they won’t receive any emails. Beeketing’s mission has always been to empower e-commerce businesses and entrepreneurs like you. We’re working hard everyday to improve everything and make sure we deliver exactly what you need. As always, we’ll be listening closely to your feedback, so get in touch with us if you want to make Mailbot a better app for both. Thanks for posting these tips. Email marketing might seem plain easy, but it needs a good strategy and thoughtful content. I got GetResponse for my campaigns and I learned early on that it’s very important to use segmentation and test the campaigns before hitting the “send” button. Thanks for sharing your thought, Sandra. 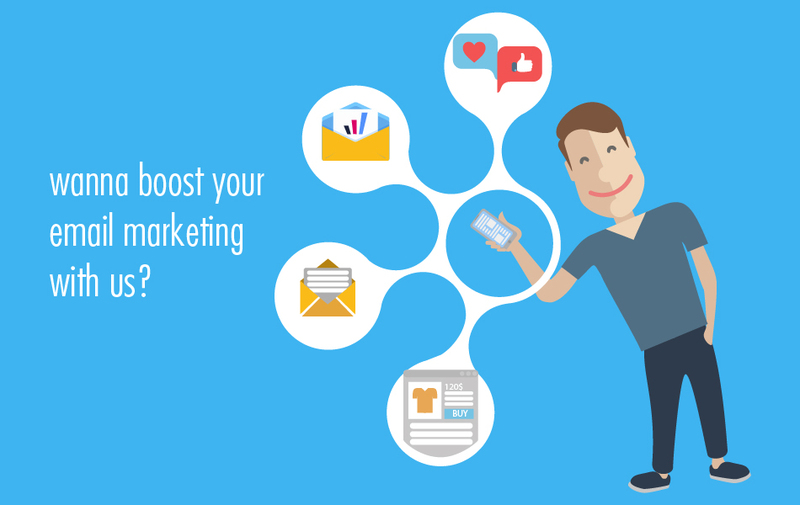 We also have other articles on how to use email marketing for your online store on this blog. Truly hope that they find you well! How to test this application? You will have 15 days free trial to test this app. We hope you like it! Hello, We have a real problem with Beeketing. Our mails are not sent. As we send it for a specific occasion, like St Valentin’s day picks , it is critical for us to send our mails in a specific time. I’ve met this problem with your tool many times: black friday emailing was not sent, St Valentin’s day we’ve tried out the whole weekend, non of our planned mails were sent. When I use a button Send Now, the sent rate is still 0. The result: our mailing for St Valentin’s day is not sent :(. Please help to understand why is that happening? I’m up to date with my subscription plan.